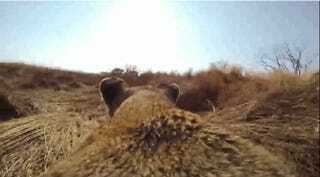 Kevin Richardson, the so-called Lion Whisperer of South Africa, is known for his use of GoPros to film intimate videos of himself interacting with lions. But this time he strapped the device onto the back of Meg the lioness, allowing him to capture the intense moments as she took down a wild buck. Yup, life is tough out there on the African plains; this video is not graphic, but it does show a buck being taken down and killed by the lioness. You may want to avoid anything after 2:40 if you're sensitive or squeamish about such things.